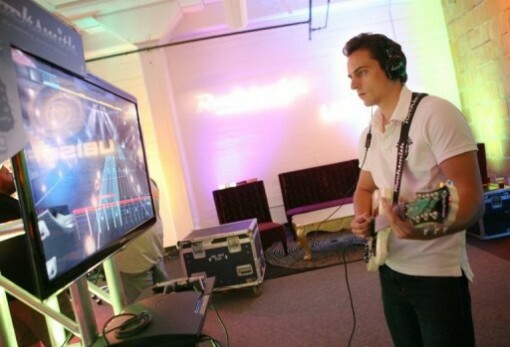 Rocksmith Video Game Teaches You How to Play Guitar for Real! While the games were a lot of fun, there was one big criticism about the game: it didn’t really teach players how to use a guitar in the real world. Sure, you still had keep the beat most of the time. And it was easy enough to pretend that you were a rock star. At the end of the day, however, you still couldn’t play real guitar for sh&t. Now what if there were a video game just like Guitar Hero that actually taught you real life guitar skills? That’s what the guys at Ubisoft have developed, and they call it Rocksmith. Who cares about being a hero who can’t do any for real when you can develop real skills? Rocksmith does this by allowing real guitars to be plugged into the console. So basically, you need an acoustic guitar with a pickup or an electric guitar. The guitar can then be hooked up to your console of choice, which of course has the game installed. Of course, one can expect this game to be a tad more complicated than the Guitar Hero series. After all, you will actually have to press and strum the correct strings to produce decent sounding music. However, the software’s strength is supposed to be in adapting to the skill of the player. Rocksmith is going to be released on the 18th of October for the PS3 and Xbox 360. The game is going to sell for $79, together with the cable to connect the guitar. If you do not have a guitar or you want a rockin’ good one, you can opt for the package that comes with a Les Paul. That one’s going to cost you a nice sum of $200, though. Now why do I have a feeling that I am going to be suckered into buying this game?